Description: Conrail leading arm LMS had a group of C40-8s that it shared with CN, but which were painted CR blue. One of them has made it onto CSX, and is leading this 84 car auto rack train west. Note also the second unit, a GP 15-1. 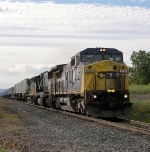 This is one of the units CSX got in the Conrail split-CR had 100 of them, new in 1979. Chessie acquired 25 of its own, a turbocharged variation called a GP15T-1, in 1982. Description: CSXT's Kinsport Sub formerly Clinchfield Trackage. Description: Q210 rolls past the NS diamond in Dalton on a "train-plentiful" yet cloudy day. Description: Eastbound on 1 by the B&O cpl signals at 58th Street with 2 original order AC4400's for power. Description: CSX 58 and 49 rolls backwards under the tipple (outside of photo) prior to loading her coal cars. Description: CSX Q353-09 with downtown Akron looming in the background. Description: Q138-09 seen from Station Square in Pittsburgh, Pa on former tracks of the Pittsburgh and Lake Erie line. The pointed building in the background is PPG Place. 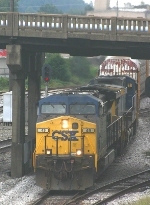 Description: CSX AC44CW 49 trails on X021 South.